I usually reserve updates for Fridays, but seeing as this little reprint arrived in the mail yesterday, I was too excited to wait. 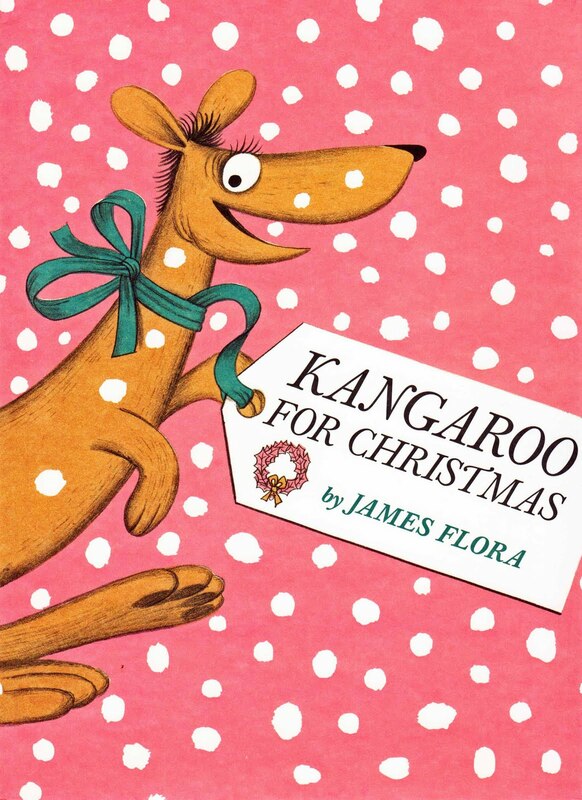 As promised, more James Flora titles are arriving from Enchanted Lion Books, with this one set for release in October. I know everyone is mired in back to school and not interested in the holidays yet, but just in case you were wondering what to get the little people in your life this year, buy a case of these and you're set. We LOVE LOVE LOVE Flora in this house, and what better way to spread the love this season than through a bouncy, pocketed friend. So just in time to help get your mind off the US drought, here's my updated post for Kangaroo for Christmas, originally posted on Christmas Eve of 2007. I updated it using scans from the new reprint rather than pulling my vintage copy out of the Christmas boxes in the attic, but as far as I can tell, Enchanted Lion (once again) has stayed genuine to the original. Lovely matte finish, gorgeous color. A dream boat of a book. Just as awesome as their other Flora reprint, The Day the Cow Sneezed. Enchanted Lion totally rules! They are planning 1 or 2 Flora reprints a year which makes them sort of miracle workers. Support these guys, cause if we don't buy these resurrected marvels, people will stop bringing them back to life. Pretty please! Just ordered it, thanks for the heads up, B! Now I have that and 'Giants Come in Different Sizes' to look forward to this fall. What am I going to do when my daughter is too old for all these wonderful books? Are there more Flora titles coming? If so, do you know which ones? The last time I looked at their site, I couldn't tell.